I love fish pie, especially made with cod, salmon and prawns….but fish is expensive!! 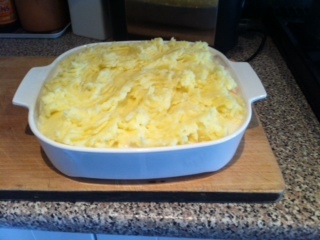 I had the wrinklies over for lunch and I fancied fish pie, so I thought I would have a go at making a budget version. This frugal fish pie went down a treat, and I don’t think anyone would have guessed! Defrost the prawns and fish and chop into chunks. Peel and cook the spuds with plenty of salt, and mash with a bit of butter and milk. Add salt and pepper to taste. While they are cooking make your white sauce and make sure it is well seasoned. Place your fish, prawns and eggs into a suitable dish and pour the sauce on top. Finally spread your mash on the top and place in a preheated oven at about 180 C (mine is a fan and this worked fine) for 40 minutes. We had this with a reduced price cauliflower and some carrots and it was yummy. I estimate this cost about six pounds all in, which isn’t bad for dinner for six people. A frugal fish pie that was quick and easy too.